As the world grows increasingly complex and fast-paced, with global issues impacting us all, making, materials, and meaning are critical. The kind of essential knowing that we develop at RISDinformed through our hands, through our bodies, and in the creation of works, experiences, and eventsis more cogent than at any other time. Artists and designers hone the capacity to generate something from deep inside ourselves to live outside of ourselves. By residing in the experiential and the physical, and by developing the "hands-on" as a portal of intelligent learning, we confirm the mind as maker and making as a state of mindfulness. We demonstrate how artists and designers are hosts for enduring creative discovery that is self-initiated and actively engaged. In short, artists and designers manifest what has not existed previouslyin many cases, what has never even been imagined. I believe that art and design have critical roles to play in innovation in this next century, much like science and technology did in the last. The very methods revealed in this book will drive the new ideas, movements, and solutions that will help us tackle the complex problems of our day. 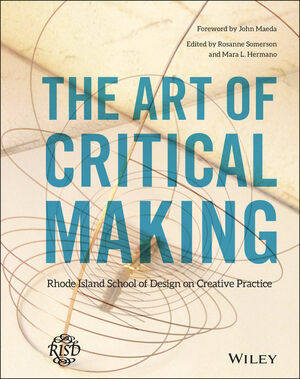 ROSANNE SOMERSON is the Provost at Rhode Island School of Design. A professor for more than 25 years, she has lectured in museums, conferences, corporations, and schools across the world. She has maintained her own studio since 1978 and has exhibited work extensively in museums throughout the United States and internationally including the Smithsonian American Art Museum and the Louvre in Paris. MARA L. HERMANO is Executive Director of Strategic Planning and Academic Initiatives at Rhode Island School of Design. Trained as an art historian, she has focused her career on the intersection of art and design, culture, and higher education.